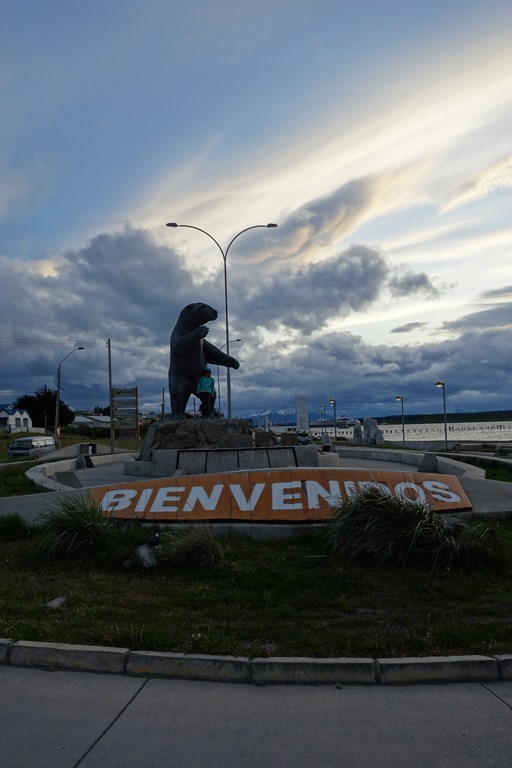 The 8am bus departure is compensated for by being scheduled to arrive at Puerto Natales, our destination, around lunchtime. It is still that early morning “just getting light” feeling as we walk to the bus station – less than 5 minutes as the town is that small! The only other people out and about at 7:30am are other backpackers or tourists pulling their suitcases. It does seem that the day here starts later as sunset is not until after 10pm – the shops certainly open later than in the UK. 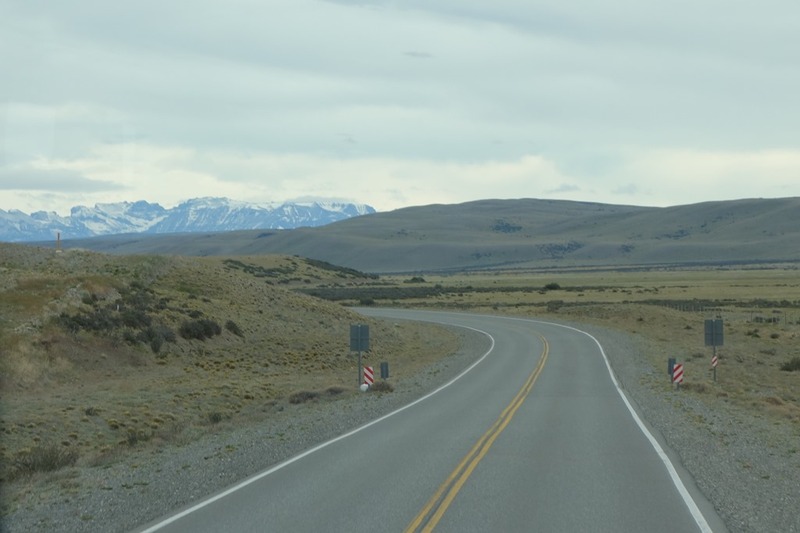 The road out of town climbs up initially before levelling off and continuing on the flat with snow covered mountain ranges on both sides. 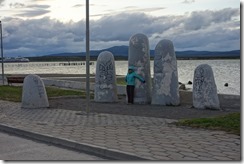 The Andes are back – we last saw them in Peru. The first hour is spent rating all the photos we both took yesterday. How many different angles can you photograph a glacier from? After a quick kip (for me anyway! 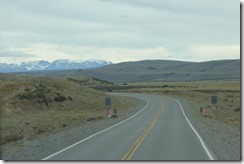 ), we turned off the famous Route 40 onto a gravel road. 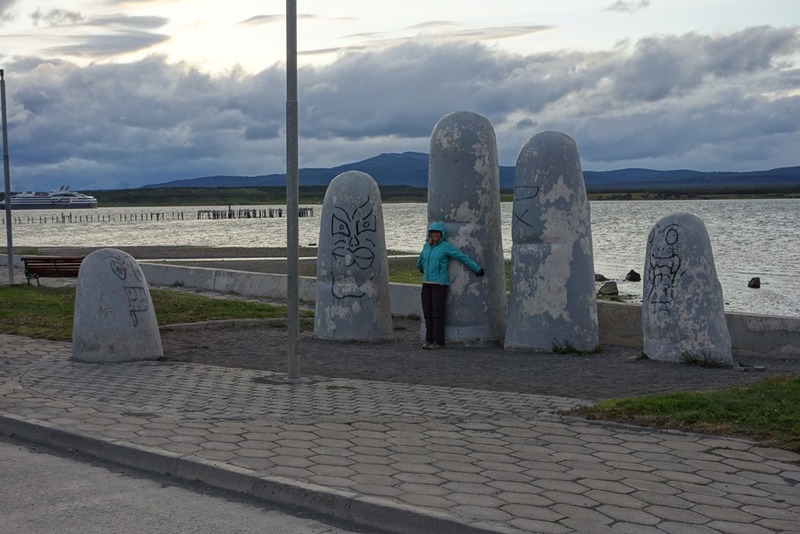 This lead to the Argentinian border where we all troop off the bus. Luckily Dave and I had ignored the seat numbers on our ticket and had sat at the front so we were one of the first to join the queue and the shelter of the building. Those at the back had to queue outside in the bitter wind in the howling gale. Apparently the border control installed a new system last week where we get a 4 part document instead of two and no-one understands the new system and it takes twice as long. After an hour at the border with only the one small building and no toilets we were on our way. Five minutes later we arrived at the Chilean Border, a posh newish building with toilets and a restaurant next door. We have to take our luggage and all our belongings with us and queue inside. Our luggage is then passed through a scanner before being reloaded onto the bus! 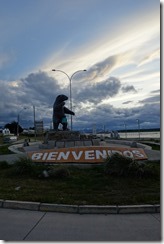 Puerto Natales is not far from the border so we soon reach town. The first impression is that the outskirts of town is the grassland have which has been fenced into small fields and single storey houses built from corrugated metal with the gardens being a continuation of the grassland. 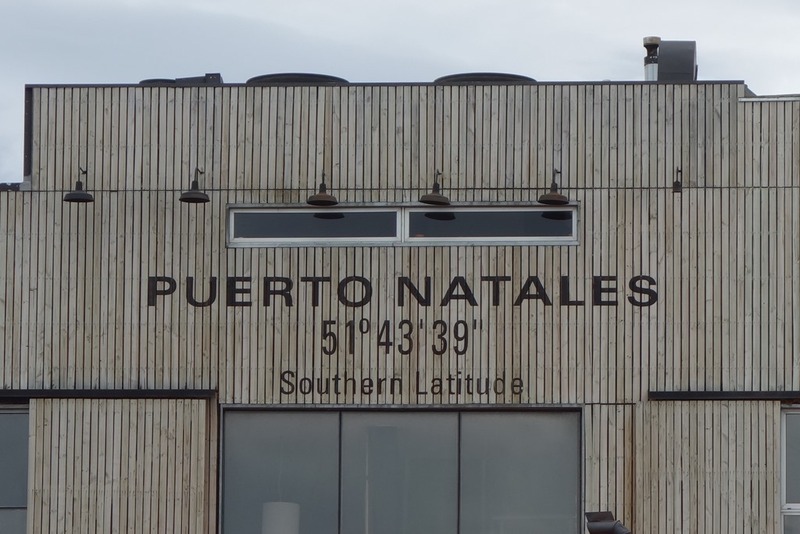 At 51o 43’ it is slightly further south than home is north. 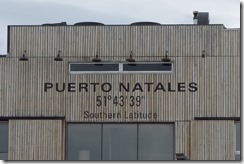 The symmetry feels odd – its certainly a long way from the warmth and sunshine of Buenos Aires. There is no bus station in town so we are dropped outside the tour operators office in the centre. It is about a 10 minute walk to our hostel, were as we ring the doorbell the owner drives passed and says “Uno Minuto”. Again the accommodation is clean and adequate, as a bonus we get breakfast which we had not thought was included. 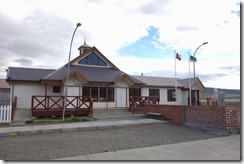 Our first mission is to book our day trip to Torres Del Paine for tomorrow and there is a notice advertising such a trip on the wall of the hostel for 22,000 Chilean Pesos and 18,000 more to get into the park. Our mental arithmetic of our 750 times table tells us that this is reasonable so we go ahead and book. The restaurant for supper was a good find, my lasagne was yummy and Dave enjoyed his Ossobucco – so much so that we go back tomorrow (Oops my tenses have gone but English never was my strong point!). 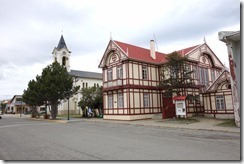 This entry was posted in Chile, RTW Trip and tagged Chile, Puerto Natales. Bookmark the permalink.